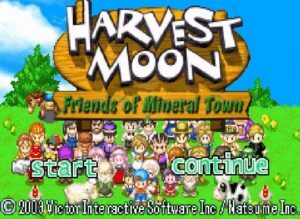 Harvest Moon: Friends of Mineral Town is the first of the Harvest Moon series to be launched in the Game Boy Advance and is a remake of Harvest Moon: Back to Nature. 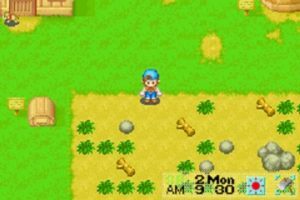 In this game, the player is a farmer whose goal is to restore a farm left behind by an old man, whom he made friends with while on a family trip when he was young. By planting crops and raising livestock, he makes profits and expands the farm. The player also goes around Mineral Town, where his farm is based on, and befriends the villagers living there, eventually marrying one of the six bachelorettes living there and settle down with a child. The player earns profits by raising crops and livestock, in turn using the profits to buy more livestock and more seeds to grow. The player can gather produce or crops and gift them to his neighbours, including the bachelorettes to foster better relationships. The storyline of this game is branching, where the player can choose to restore the farm any way he likes. Out of six bachelorettes, the player can choose any of them to woo, which eventually leads to the end game of marriage. The game is made with a simple design, where the player can easily discern the objects around him. By having a simple design, it emphasises the rural setting that Mineral Town is based in. The theme music changes with each location and season, which brings out the corresponding mood that the setting should have. For example, in the spring, the music is more cheerful, signifying the start of crops growing season whereas summer had a more upbeat music, to signify the abundance of crops growing in the season as well the festivals held that season. The game is launched in the Game Boy Advance platform, which has a higher screen resolution and longer battery life than its predecessor, the Game Boy colour. As opposed to video gaming consoles such as the Playstation, the Game Boy Advance is easily carried around, providing the option of gaming on the go, when the game was launched. The simple aesthetics of the games emphasises the setting of the story in rural Mineral Town, as well as ties in with the simple mechanics, where the player has the clear cut goal of making profit and fostering friendships with the villagers. The Game Boy Advance had also been essential in bringing out the aesthetics of the game, as well as provide the player with playing on the go experience. One of the game’s main mechanic is giving gifts to the villagers. Upon receiving the gifts, the villagers will express delight and the bachelorette that the player is currently wooing would give appropriate reactions, both of which would give the player a sense of pleasure, knowing that he made a person happy. The game also provides player the pleasure of pride in an accomplishment. The player grows crops in the games, gathering a sense of achievement whenever the crops are fully grown. Furthermore, in taking good care of his livestock, the player can then take part in festivals with the respective livestock, winning if the bonds with the livestock is strong enough. The sense of accomplishment in the victory and as well as seeing the grown crops can also give the player a sense of pleasure. The game is built on the profits that the player earns. The player can earn money through several ways, but the main source of income will come from selling grown crops and products from livestock. The amount of profit from crops usually depends on how long the crop takes to grow and also the price of the seeds itself, whereas the profit from the produce of the animals depends on the grade of the produce, which increases with the affection level of the livestock towards the player. Both of this means that the amount of profit a player can earn is proportional to the work put in by the player. Using the profit earned, the player can choose to expand the farm further, buy better tools, or livestock. The player must spend wisely among his budget, such as buying the correct expansions and leaving enough money to buy livestock and seeds. Other than gold, the currency earned by selling produce, crops and other stuff the player picks up, there is also another currency, medals, which the player earns by betting in horse races. Medals work in a separate system from gold, which allows the players to buy items than gold otherwise could not have bought. The game has a few weird elements, which provides amusement to the player. One example would be Kappa, a mysterious green creature, that lives in the lake near the player’s farm. Kappa only accepts a gift, which is cucumbers that the player can grow. However, being antisocial, Kappa will ignore the player’s gift at first until the player throws in cucumber to him for 10 consecutive days, which prompts his appearance and his gift of a special power berry to the player. 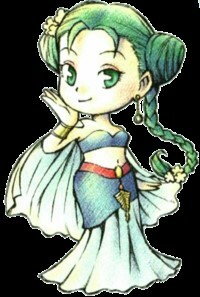 Another example would be the Harvest Goddess, who lives in the Hot Springs. The Harvest Goddess, as implied by her name, is a god, who the player can throw offerings to. However, the interesting element is that the Harvest Goddess is a secret Bachelorette for the player, and probably has the highest requirements for marriage among the bachelorettes in the game. An interesting element of the game is that the player has complete freedom over what to do in the game. Since there are many options on expanding the farm, the player can choose to focus on any area of the farm to expand on first, for example, he can focus on just growing crops or expanding more on livestock to care for. The player also has the freedom over choosing the livestock to rear. Another option that the player has clear freedom on is the befriending of the villagers and the wooing of the villagers. The player can choose on which villagers to befriend or even not to befriend any at all. Also, the player can choose one between the six bachelorettes to woo or even woo all six at the same time. This entry was posted in 2017/18 Semester 2 by weiyin17. Bookmark the permalink.